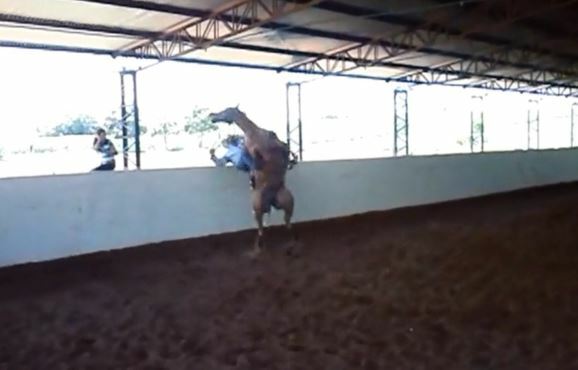 At a clinic in Brazil, Les Vogt got on someones horse and ended up getting body slammed. He explains this as one of the reasons he’s reluctant to get on strange horses at his clinics. Fortunately both Les and the Horse were able to walk away from this. The horse was not hurt. Les Vogt is a 15 time World Champion Cow Horse Trainer. The Story Of A Man And His Horse – Giving Budweiser Some Competition! Well… I only heard of him once and never saw him riding (I live in Italy), but I don’t like what I saw in this video. The horse was obviously in pain and forced between those tight draw reins, right before flipping over the rider gave him a couple of big yanks. We all get hurt sometimes, so I’m glad nobody got hurt, but I don’t like what I saw anyway. Sorry. I only hope the horse didn’t get punished for this. This horse reacted to pain as his mouth was ripped into. Notice the so called world champ trainers left arm held way back and then gives the right rein three sharp jabs. The horse reacted in the only way it could but what should have followed is the horses owner should of kicked the trainer while he was still on the ground for ruining his horses mouth. I dont care how famous you are! What just happened in this video is not training! What would Buck do that would have been better? I totally agree on Roberta’s comment! Woa, I couldn’t see enough detail as to the tack used – To me it looks like the main source of the problem could be through the horses hips and SI joint, not uncommon when horses are forced into a ‘collected’ tight frame and they don’t yet have the strength or suppleness to comply with what the rider was asking. I have little sympathy for any so called trainer who uses inhumane gadgets like draw reins and then over faces the horse to force movements. I surely hope the people that own this horse use their brains and have the horse checked out to an equine chiropractor and massage therapist. Truly, what a bunch of idiots. I wasn’t there. I didn’t see it first hand. I never met this horse. I have, however, studied with Les Vogt. I think that to form an opinion of why something happened and pick out negatives is unfair to the trainer and to the horse. I could watch a thousand times and still not know what really went on. So, all you arm chair trainers, and weekend trail riders need to comment about and criticize the things you know. couldnt agree with you more !!!! I completely agree. To judge a horse or trainer by one mishap is foolish. I think his reluctance to get on strange horses at clinics is wise. Getting into a horse too much, especially one that is not familiar with you, will typically have this kind of outcome. Glad he is ok.
It’s not a picture. It’s a video. You can look right at it and see what he did. He pulled up on a bit and it twisted on the horses palette. Watch the horses mouth as he goes over. He turned the horse in too tight while inflicting a lot of pain. The horse jumped to release out of pain and lost footing. It’s not rocket science. No vaquero EVER did this kind of slam dance on a horse. This is the old style of pain and dominance training. It’s going away now because of the cruelty and counterproductive behavior it creates. It was bad training then and it’s bad training now. lhorten, if you watched the video and didn’t see him jerk that horse’s mouth, you must need glasses. Hopefully you don’t condone that type of training, but if you do, more power to you. Telling people to criticize things they know is a futile argument, since they obviously saw the same thing I saw — abuse to the horse’s mouth. I hate to imagine how long it will take for a repeat of this behavior, since bad habits form quickly. He designs leverage bits. Nuff said. Le designs leverage bits. Nuff said! I agree, I hope the horse does not get punished! Yet another name to add to my list of trainers to NEVER let touch my horses. What an idiot!!! The horse reacted to unwanted and unreleased pressure by rearing and falling over which gave the horse a release from the pressure. The trainer reinforced rearing and falling over by coming off. The horse did a good job, he got an escape from pressure. The trainer did a pathetic job. He got dismounted and is lucky he did not get killed. If he would have gotten killed the headline would have read, “World Champion Trainer Killed In Freak Accident”. I would bet that the horse will get the blame for being “naughty” and the trainer will blame the horse. Fully agree with you and your observations, Roberta. Truly, he yanked on that horse. On a strange horse? On any horse! Good horse. I love it. Les Vogt really reserved this! Whoa!!!!! Lucky it didn’t go straight up and over and been seriously injured. Looks like a pretty nice horse and not expecting to be cranked like that! May have rushed things not knowing the horse!! Horse may have had issue’s before Les got on? Great to see nobody was hurt and hopefully everyone learn’t something from this?? I know I did!! What a fantastic trainer! Draw reins AND shank bit (maybe correction)… Moreover bad hands. My horse scores 72 at reining, he is an ex limited open horse, now non pro horse. But he could never bear such a training. Disgusting. Looks like horse might need his teeth done…. I feel like this is a good example of a horse like mine… he does really great until one little tiny thing is bothering him. He’s like the princess and the pea. I think he has a tooth right now that has a bit of a hook on it, not a major thing. Just a minor one that would be nothing but a slight irritation to any other horse but to him its the end of the world. I feel like this could be the result with him if I don’t get his teeth done soon. Just pop the rein to get him to pay attention and he’d lose his mind over it. Before I get hate, yes I realize it is important to do maintenance for your horse. You know, teeth, feet trimmed, etc. Dually is 6. Had his teeth done for the first time when he was 3. I make sure that I can keep him as comfortable as possible because he is so sensitive. When I picked out a new saddle for him I looked at I dont know how many and tried 3 out for a week. I bought one that fits him as best as I could find even though it is about a half inch bigger seat then I would like for myself. He’s sensitive.. he is a horse you can’t use a curry comb on without him getting an attitude, he can feel the slightest move of my leg while riding yet when he doesn’t want to do something he acts like he can’t even feel a kick so yes, I have to get after him too and it looks bad for someone who doesnt know the horse. I don’t ride with spurs anymore because he no longer needs them but some days I do give him some good hard kicks because he is flat out ignoring me. Also, potentially this horse was being ridden in a copper bit. A soft metal that is easily bitten by a horse and that can cause the bit to have sharp points that perhaps the rider did not notice or maybe occurred during the ride. I highly doubt that just a few pops with the reins made this horse flip himself over without another reason. Amanda, quit while you’re behind. I’ve had horses with blind wolfs teeth. I’ve trained them with daggers in their mouths and found out the owners have never seen or even heard of a dentist. I read it, stop and get it taken care of before another minute goes by. I have seen enough cracker training to know what looks like. Leverage bits and wire bits and tiedowns and every other kind of torture device. Never saw any reason to use em or talk to people that do; and I can’t remember the last time I had to lay a heel to any horse in 40 years. I’m going to recommend Parelli or Brannaman to you. Either can show you ways to do it a lot better. Oh Geez, Don’t recommend the Profit Pat Parelli, this crap wrecks the horse’s natural movement. The Profit Pat promotes lunging on a really tight circle, which destroys the trot and canter. Yeah the horse learns to slow down his canter but it becomes a 4 beat canter with the horse pushing off from his front legs rather than use the strength from the hind end. Plus the Profit advocates the most unnatural training techniques(the games) only the really beginners fall for. Brannaman and Parelli are a joke. I have better things to do than shake a stick at my horse. FYI-Parelli isn’t liked so much right now in Europe. Apparently rode a horse to complete exhaustion until it collapsed. Anyone who is an experienced rider knows that yanking on the reins like this will most likely lead to a horse rearing. It’s so much easier to blame your bad behavior on the horse who cannot defend himself. 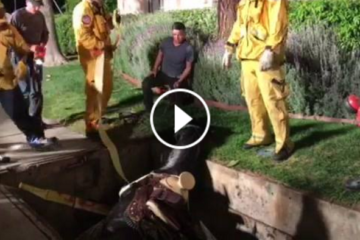 I love how it says the horse in this video was not hurt. That’s BS! Try wearing a bit yourself and having someone yank like this on one side while pulling hard on the other and see if it doesn’t hurt you. That’s torture and cruelty. Yeah, he probably shouldn’t have been so rough on the horse’s face. That’s what happens when you have a sensitive horse and then hurt it. I don’t care how many championships this guy has. The horse is behind the vertical, he’s being forced into a shanked bit with draw reins, and this guy still cranked on his face. The poor horse had nowhere to go when his mouth hurt but backwards. This is not training, it’s forcing the horse to submit what you want. And quite frankly, this horse clearly doesn’t care how many championships he’s won either. And if you run a clinic and you’re afraid to ride other’s horses, you’re either not truly a good trainer, or you need to buck up and wear a helmet. He also basically blamed it on the horse: this is why he doesn’t ride other people’s horses. Then why claim to be a trainer? I completely agree. Spoiled horse. One of the most important thing to understand before critizing the trainer. Was the owner of the horse honest with this horse and why was it at the clinic in the first place?? I have been to many clinics where people would over rate their horse as broke and no habbits. I personally feel folks have to be better educated and honest prior letting anyone else evaluate your horses. 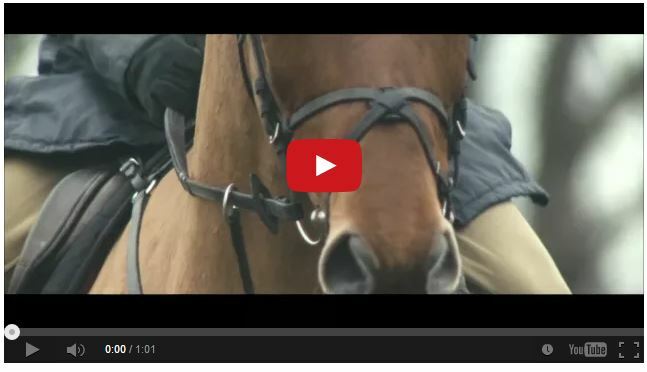 I do not judge this video as a trainer fault but the fault of the owner. One other factor is the horses teeth properly cared for as so many horses are mouth sore from teeth and not the training draw reins or bits…..
Have the western riders gone Rollkur? This horses head sure seems over flexed. He is a Lusitano (probably stallion), that is there natural headset. Iberian horses can’t be yanked around like quarter horses. They are very sensitive in the mouth. They are going to react completely differently. It is like riding a different species… he should stick to quarter horses, he isn’t good enough to ride a Lusitano. Les Vogt designs spurs and bits – he rides made horses to win championships. If you are trying to use a one-rein stop, use one rein. He got what was coming to him. Glad he was not hurt, hope the horse gets over the rough treatment. I think the horse has been a bit of a handful & that’s why Les was on him, to show how to change a problem that was occurring . . . I am just guessing here like everyone else, none of us were there & very few of us, if any, have the knowledge that this man does. We need to be respectful of others . . . I use what I have learned and follow a Mark Rashid type of horse “training.” (passive leadership)(not the ALPHA hype) MY personal horse does not have a bit in her mouth, I ride in BMSS treeless saddles . . . I use what works for me, I used to run barrels & I love to trail ride . . . I am not in the same discipline, nor will I ever acquire all the knowledge this man has to share with people who aspire to be like him . . . to each their own . . . RESPECT IS KEY . . . Respect is earned. Judging from how he handled that situation he doesn’t deserve any. Not on one of my horses. Not ever. 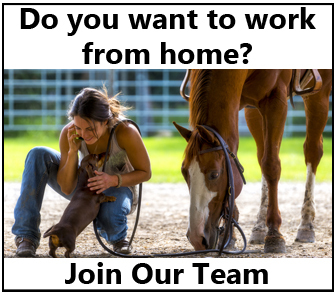 I talk to people who have horses who seem to be happy doing what they are doing about who trained their horses. But I ALWAYS talk to the horses themselves before choosing a trainer. This guy, no matter who he is, no matter how big his name,no matter how many followers he has, just failed, based on what I saw in the video and on what the horse had to say (and note that after this the horse was perfectly well behaved – that was not a mean horse but a horse not being listened to, in pain, doing the only thing left to it to try to communicate “Get this idiot off my back!”). THANK YOU. Finally an intelligent person. How anybody can watch that video and see that childish act as “training” is sad. A horse should NEVER EVER EVERRRRR do that! Even if he is a bad trainer and yanked on the mouth. All dangerous behaviors need to be eliminated before any real training can start. If that were my horse he’d wish he never ever did that and I can promise he’d never do it again. Horses are living creatures with nerves and senses. If you expect your horse, or any horse, not to respond to pain, then you are seriously lacking in the brain area and should stick to inanimate objects.